The Carl C. Coffin Lectures are given annually by graduates of the Department of Chemistry who have distinguished themselves in their careers since leaving Dalhousie University. The Lecture Series is named in honour of Carl C. Coffin, the fifth Head of the Department of Chemistry at Dalhousie University. Department of Chemistry Chair, Dr. 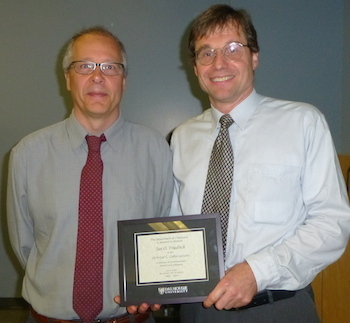 Norm Schepp, on the left, with our 2014 Carl C. Coffin Lecturer, Dr. Jan Friedrich, BSc (Hon Chem, Dalhousie, 1985). Upcoming Carl C. Coffin Lectures can also be found in the Seminar Schedule. Carl Coffin was born in Tatamagouche, Nova Scotia, on March 14, 1903, the son of the Rev. Robert L. and Alice (Cowan) Coffin. He attended Prince of Wales College, and entered Dalhousie University with the first Sir William Young Entrance Scholarship. He obtained his BA with distinction in 1924, and after two years spent in the research laboratories of Shawinigan Chemicals Ltd, went on to McGill for graduate work. At McGill he held National Research Council scholarships throughout his course, and took his PhD in 1929 under the direction of Professor Otto Maass. The period at McGill was a particularly happy one. Like Maass, Coffin was primarily an experimentalist, and one of very great originality and ingenuity. He had a particular flair for doing things with high accuracy in the simplest possible way and with a minimum of equipment. After McGill, Coffin spent a year at Utrecht with Ernst Cohen on a travelling fellowship, and then returned to Dalhousie as a Lecturer, Assistant, and Associate Professor. In 1942, he was made Head of the Chemistry Department, holding the McLeod Chair of Chemistry for two years, and was then appointed to the newly established Harry Shirreff Chair of Chemical Research. Coffin had a great influence on the development of Canadian chemistry, and in particular on the development of scientific research at Dalhousie. In recognition of his attainments he was elected a member of the Royal Society of Canada in 1935 at the early age of 32. During the war he played a considerable role in the chemical warfare program. At the end of the war he became interested in radiochemistry and a start was made on a number of very interesting problems in this field. Unfortunately, as a result of a tragic accident in 1949 he largely lost his sight. In spite of this, however, he carried on his university duties, but of necessity his scientific work was greatly cut down. This accident and his untimely death undoubtedly prevented a further great development of chemical research at Dalhousie, and constituted a major loss to Canadian Chemistry.